In the last 12 months, google searches about Barry Bonds and Roger Clemens tended to focus on far different matters than searches about Lance Armstrong. Bonds and Clemens searches were mostly related to performance enhancing drugs; recently, searches from 4,000 locations about Armstrong tended to be about his racing, particularly his competing in Ironman triathlons in 2012. 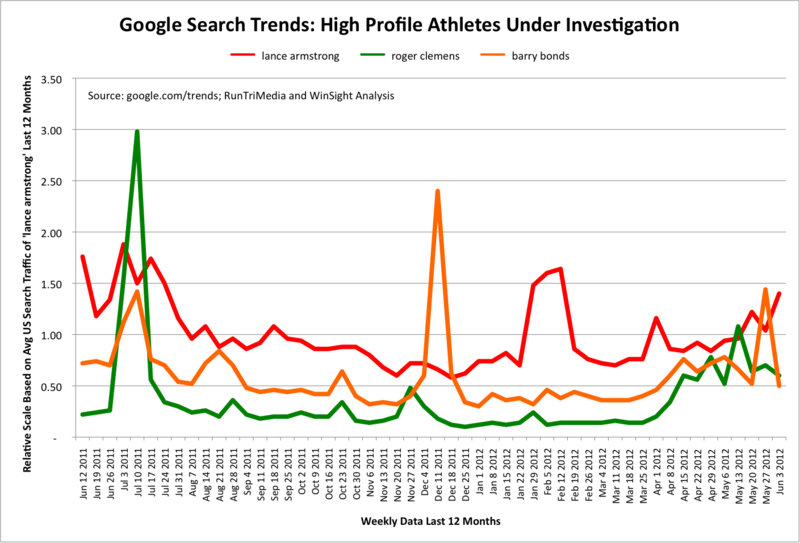 With news of USADA's investigation on 6/13/12, searches for Lance Armstrong have clearly surpassed Bonds and Clemens, and, unfortunately, quite possibly not because of interest in his performance on the race course.